According to the result of the analysis, Japan's ecological footprint was 4.1 global hectares (gha) (*1) per capita in 2006, 1.5 times the world average, whereas its biocapacity was 0.6 gha per capita, which is one-third the world average. This means that Japan depends on imports to make up for the shortage. If everyone in the world lived the same way the Japanese do, it is estimated that we would need 2.3 Earths. In Japan, 65 percent of its total ecological footprint is made up of its carbon footprint, and its carbon footprint in the late 1990s was 13 times higher than in 1961. 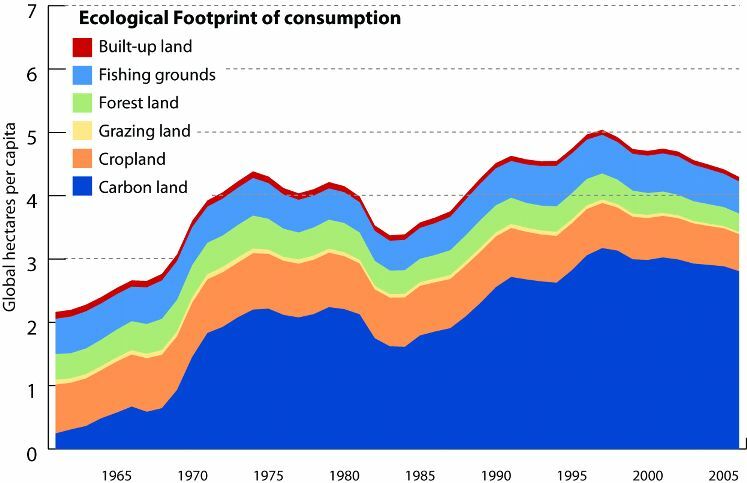 Looking at ecological footprint in terms of household consumption, food accounts for a large part (36%) of total household consumption, and food waste in Japan has reached 13.8 million tons per year based on 2005 data -- 1.7 times the volume of food aid worldwide. Thus, reducing food waste will substantially improve Japan's total ecological footprint. Regarding the country's carbon footprint, WWF Japan submitted a petition to the Japanese government related to the specific use of the ecological footprint as an environmental indicator. WWF Japan explains in the petition that reducing carbon dioxide emissions through the introduction of domestic emissions trading and an environmental tax would lead to a decrease in the country's overall ecological footprint. Note 1: Biological productivity varies depending on the climate and utilization form. Gha is a measurement used to standardize biological productivity by adjusting those differences. One global hectare is equivalent to one hectare of land with average biological productivity.